In addition to introducing our readers to new comedians, from time to time we've been doing the same for new musical groups and highlighting some of their songs. Today we discovered the new bluegrass group called Nefesh Mountain. 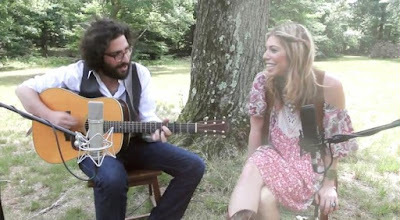 Founded by husband and wife team Eric Lindberg and Doni Zasloff, Nefesh Mountain is pioneering this blend of Jewish Americana throughout the country, bringing their unique knowledge and passion for both Jewish and Bluegrass traditions to the fore, singing English and Hebrew songs alike. As a duo, Doni and Eric alternate lead and harmony vocals while switching between instruments, using the drive of the banjo, intrigue of the guitar, nuance of the mandolin, and visceral sound of the dobro. You may recognize Doni Zasloff as Mama Doni, the role she has played in producing CD and DVD albums of children's songs. In 2012 we featured her video Mission Immatzoble as one of our Passover posts. Nefesh Mountain conducts Shabbat and holiday services around the USA. Their first album will be released later this year. Here is one of the songs from the album, Hinei Ma Tov. Enjoy!